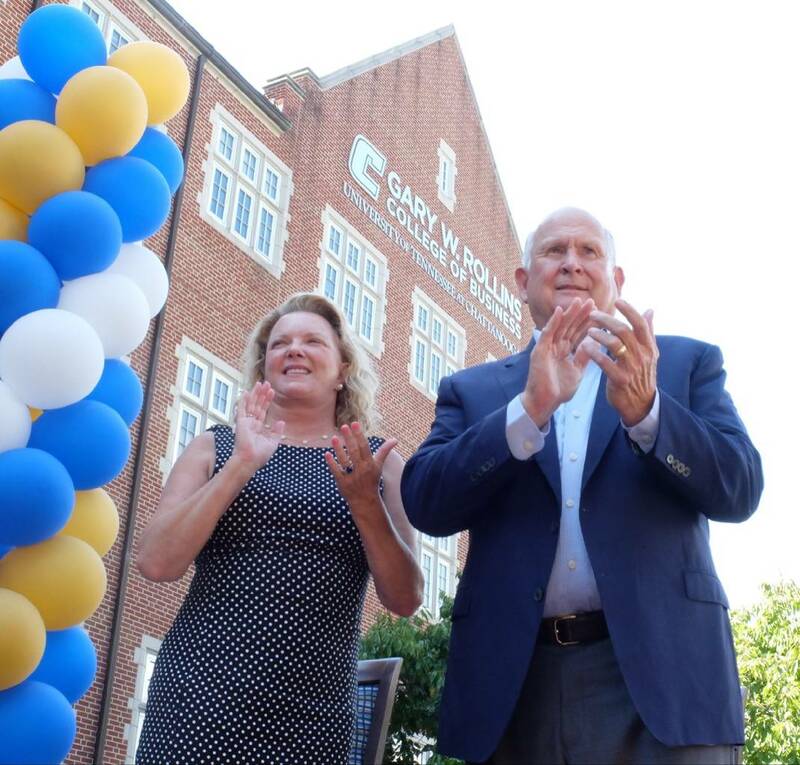 University of Chattanooga graduate Gary W. Rollins, right, and his wife Kathleen stand in front of the Gary W. Rollins College of Business Thursday during a campus-wide celebration of their $40-million gift to the school. The gift was the largest single gift in the history of the University of Tennessee at Chattanooga. Photo by Tim Barber /Times Free Press. CORRECTION: An earlier version of this incorrectly stated how much of the Rollins' $40 million gift will be used for student scholarships. $10 million will be used for endowed student scholarships, not $10,000. The University of Tennessee at Chattanooga is celebrating the largest gift ever made to the university — $40 million — with the renaming of the Gary W. Rollins College of Business. The historic donation by businessman Gary Rollins and his wife, Kathleen Rollins, was announced in June after it was approved the University of Tennessee Board of Trustees. The money will be used for capital renovations, student scholarships, faculty and more. "His investment in the college goes far beyond the substantial financial investment he and Mrs. Rollins have made," said Robert Dooley, dean of the College of Business. "He has entrusted us with his legacy by giving his name to the college. Through his trust, it is our responsibility to encourage the values that have shaped his business career and company ... values that include recognizing hard work and commitment, never taking the easy path, and knowing success is dependent on individuals who give their best every single day." An undetermined amount also will be used to hire three faculty members, or chairs of excellence, to focus on specific areas or programs within the college. The remaining funds will be set aside in an endowment for future use, Dooley said. A celebration and naming ceremony was held Thursday on campus. "It's transformational in the quality that we are striving for," said Steve Angle, chancellor of UTC. "The renovations of educational space, scholarships, endowed chairs and other programs that are going to be impacted ... what an opportunity." Gary Rollins graduated from the college in 1967, when it was still the University of Chattanooga. He is vice chairman and CEO of Rollins Inc., a New York Stock Exchange corporation and one of the nation's largest pest control conglomerates. In 1978, he was named president of Orkin, an Atlanta-based pest control company purchased by Rollins Inc. by his father, Wayne Rollins. Among the reasons Rollins said he chose to make the gift to UTC was because of the education he received and the persistence of the university's leaders. "I got a very good business education here," he said. "I know of nothing more important to prepare to win, to be successful than learning how to work. You buy success with effort, just like you buy groceries with money." University leaders noted that the increasing success of the college's students helped land the donation. "Our students are nothing short of amazing, and they are the reason we received this gift," Angle said. Jujuan Lewis, a senior majoring in finance and president of UTC's Student Government Association, said he was excited to see how the gift would increase opportunities for students. "We're part of a significant milestone in UTC history," he said to the students at Thursday's ceremony, "a milestone that will affect you and all the students that come after you. In the immediate future, your gift will mean college of business students will have access to more resources and opportunities to help build our careers." This gift, years in the making, is also a milestone for the entire University of Tennessee system, which has named three colleges in recent years. "Gifts like this don't come very often," said Joe DiPietro, president of the UT system. "This being [a gift] to this college, I would say is the most profound impact being [that] it is a regional campus." Contact staff writer Meghan Mangrum at mmangrum@timesfreepress.com or 423-757-6592. Follow her on Twitter @memangrum. This story was updated Sept. 14, 2018, at 10:59 a.m.